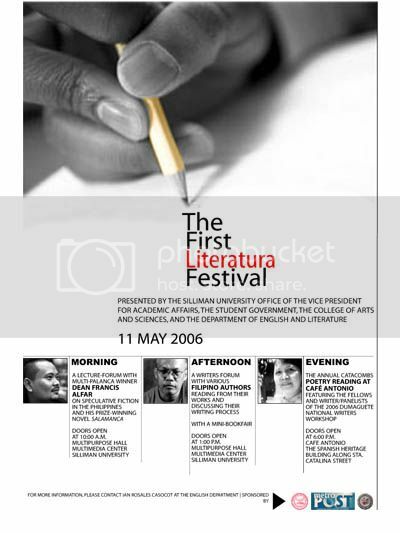 11 May 2006, Silliman University, Dumaguete City. Novelist Dean Francis Alfar will talk about speculative fiction in the Philippines in the morning lecture-forum, and will participate in a reading and a discussion about the creative writing process in the afternoon with Sillimanian authors Cesar Ruiz Aquino, Myrna Pena Reyes, Ian Rosales Casocot, and Stacy Danika Alcantara. The Annual Catacombs Poetry Reading with the fellows and panelists of the Dumaguete National Writers Workshop will be held later in the evening at Cafe Antonio. The readers include Marjorie Evasco, Larry Ypil, and other writers. Tomorrow night, we're tackling The Golem by Avram Davidson, Editing for Content by Gavin J. Grant, and We Have Always Spoken Panglish by Suzette Haden Elgin. While I'm gone, the group will read a novella - New Light on the Drake Equation by Ian R. MacLeod. Lots of sci fi, I know. In the coming weeks, I intend to swing the focus once more towards modern fantasy and realism (my bias is obviously towards fantasy - we've tackled Kelly Link and Jeffrey Ford) because there are so many good stories to be read and savored and learned from and remembered. I'm also looking for stories by Greg Brilliantes and other Filipino fantasists, as well as digital versions of a couple of pieces by Chari Lucero (for her adroit combination of realism/magic realism - and because I'm a huge admirer of her work, boldly telling her so at the last National Books Awards night).